More Americans used the Internet to get campaign information in 2002 than during the last midterm election four years ago. While much of this increase has come from the overall growth in the online population, a higher proportion of Internet users sought election news than did so four years ago (22% now, 15% in 1998). The Internet was a less important source for such news in 2002 than in 2000, but midterm elections typically engender less public interest than presidential contests. 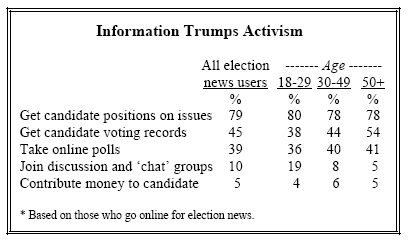 Information on candidate positions on the issues was the top draw for online election news consumers. Nearly eight-in- ten (79%) said they researched where candidates stood on issues, up significantly from 69% in 2000. And more than four-in-ten election news consumers (45%) researched candidate voting records; that also represents an increase from 2000 and 1998. This is consistent with an overall increase in the number of Internet users who said they looked for information on specific issues like the environment and gun control. The sites of major national and local news organizations continued to be the leading sources of online campaign information. Roughly half of online election news consumers (52%) said they went most often to the sites of major national media organizations such as CNN and the New York Times, while 18% cite websites of local news organizations. But specialized political and issue-oriented sites are becoming more popular. Three-in-ten online campaign news consumers said they went to such sites most often, compared with 19% in 2000. The nationwide survey among 2,745 adults by the Pew Research Center and the Pew Internet and American Life Project found that the Internet was a principal source of campaign news for only about one- in-ten online users (11%) and just 7% of the general public. Among those who said they went online for election news, the Internet rivaled newspapers as a main source for campaign information (31% cited the former as a main source of election news, 33% the latter). But even among this group, television remained by far the leading source of election information, with half listing it as their main resource. While the Internet has not made significant gains in recent years as a primary outlet of election news, it does serve as an important source for young people who go online. Among those under age 30 who go online, 16% said they got most of their election news from the Internet, far more than any other age group. For these young Internet users, the Web ranked with radio (15%) and slightly behind newspapers (22%) as a source of campaign information. While the online audience for campaign news has grown over the past four years, those who went on the Internet for election news did so less frequently than in 1998 or 2000. Among the online audience for election news, 59% in 2002 said they went online at least weekly, compared with 65% in 1998 and 75% in the presidential election year of 2000. The profile of online election news consumers continued to be dominated by upscale, veteran Internet users. Men more than women, whites more than minorities, highly educated more than less educated and the wealthy more than the poor went online for election news. But use by women and minorities is growing. In 1998, 61% of online election news users were men and 39% women. In 2002, that gap narrowed to 57% men and 43% women. In 1998, nine-in-ten election news consumers on the Internet were white, but that number slipped slightly to 84%. Minority representation among election news consumers rose from 9% in 1998 to 13% in 2002. Although college graduates continued to constitute half of the online election news population, there was modest growth among the less educated, with non-college citizens representing 23% in 2002, up from 18% in 1998. A plurality of election news consumers (37%) had family incomes of $75,000 or above, a figure that increased 14 percentage points since 1998. 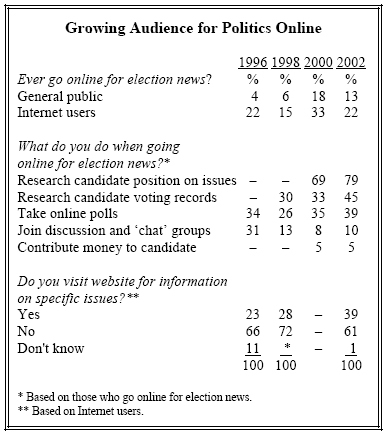 The age profile of online election news consumers has not changed substantially since the 1998 election. Just over a quarter (27%) were under age 30 (compared with 24% in 1998). People age 65 and older still constitute a tiny fraction of the online election news audience – 5% in 2002, 4% in 1998. In general, Internet newcomers were less likely to go online for election news than those who have been online for several years. 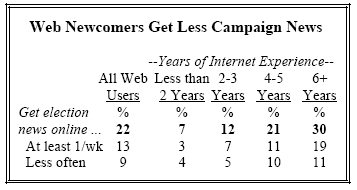 Just 7% of those who have been online for less than two years sought campaign news during 2002. By contrast, more than four times as many of those who have been online for at least six years (30%) went online for election news. Those who went online for campaign information were motivated both by the convenience of the Web and by the greater range and depth of information it provides. Nearly six-in-ten (57%) of those who got election news online said that convenience was an important reason for doing so. This is about the same percentage who cited convenience in 2000. 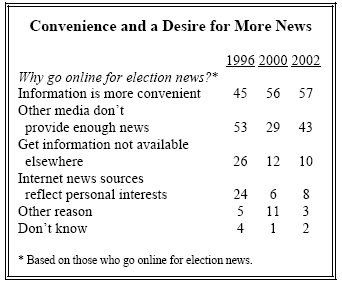 A sizable minority of online election news consumers (43%) said they went online because they could not get all the news and information they wanted from traditional news sources, up from 29% in the 2000 election (though lower than the 53% who said this back in 1996). 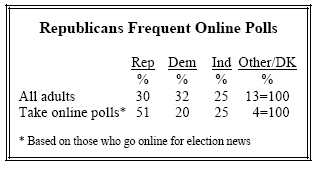 Republicans were more likely than Democrats to cite this as a reason for seeking news on the Internet (50% vs. 36%). The range of ideological perspectives on the Web is large, but very few online election news consumers said this is a major reason for them to turn to the internet. Fewer than one-in-ten (8%) said they went online for campaign news because the Web offers new sources that reflect their specific interests or values. Liberals and conservatives were no more likely than moderates to mention this as a reason to go online for election news. As was the case in the midterm elections four years ago, statewide elections attracted the greatest interest from online news consumers. 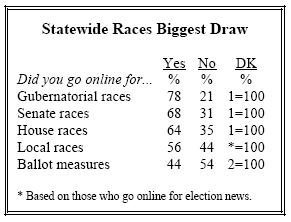 More than three- quarters (78%) said they got news about gubernatorial races online, and two-thirds (68%) went online for information about Senate races. Nearly two-thirds (64%) went online to learn about House races, and 56% sought information on local races. Roughly four-in-ten election news consumers (44%) said they got information about ballot propositions. Among the online audience for election news, men and women displayed similar interest in all types of races except for local contests: women were 10 percentage points more likely than men to follow local races online. This election year saw a sizable increase in the proportion of online election news consumers who sought information about candidates’ voting records and positions on issues. Roughly eight-in-ten (79%) looked for information about the candidates’ issue stances, and nearly half (45%) sought out information about their voting records. Both represented significant increases over 2000 (69% for issue positions and 33% for voting records). 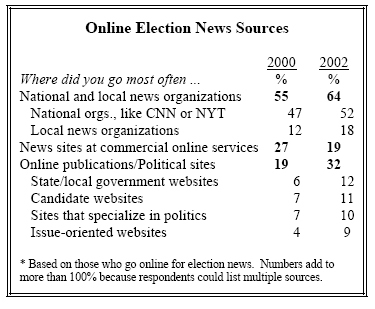 Online polls were somewhat more popular in 2002 than in recent elections. Roughly four-in- ten election news consumers (39%) said they participated in such polls, compared with 35% in 2000 and 26% in 1998. Although just 10% of online news consumers said they participated in online discussions about politics, the rate among young people was almost twice as high (19%). The growing number of voters seeking information about the candidates was mirrored in a sharp increase in Internet users who reported visiting websites that provide information about specific issues or policies such as the environment, gun control, abortion or health care reform. Nearly a quarter of all Americans (24%) and 39% of Internet users said they visited such sites. Young internet users were more likely to seek out websites with specific policy information (45% among those 18-29), compared with those 50 and older (34%). Men and women did this in equal numbers. Better educated Internet users did this more commonly than the less educated, but even among Internet users with less education (those with a high school education or less), about a third visited a web site for this kind of information. Newcomers to the Web visited information sites at about half the rate of long-time Internet veterans. Most election news consumers relied on well-known news organizations for information on the campaign. In 2002, nearly two-thirds (64%) of online election news consumers visited the sites of major media organizations like CNN and the New York Times, or local news organizations. This was a significant increase over 2000, when 55% went to these kinds of sites. A little over half of online election news consumers (52%) went to the national news sites, while nearly 18% went to local news sites, up from 12% in 2000. 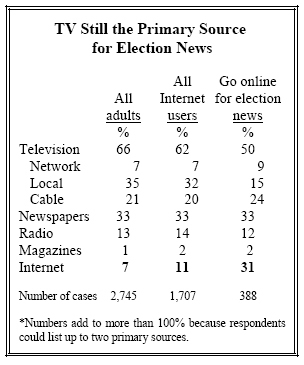 These sites were even more popular during the 1998 campaign (29%). About one-in-five (19%) election news consumers said they went most often to the news sites of AOL and other online services. That is a significant decline from recent years: in 2000 and 1998, more than a quarter of election news consumers relied mostly on these sites for campaign information (27%, 26%). At the same time, more specialized political sites gained ground. Nearly a third of online election news consumers (32%) said they went most often to government and candidate websites or sites that specialize in politics, up from 19% in 2000. Within this category, state and local government websites are drawing more election news consumers: twice as many went to these sites as did so in 2000 (12% vs. 6%). But visits to candidate websites were up as well (11% vs. 7% in 2000), as were visits to issue-oriented sites (9% vs. 4%). The most active consumers of campaign news – those who sought information on candidate positions and on how candidates voted – followed more races and went to more websites than did more casual consumers of such information. Four-in-ten election news consumers researched candidate positions and voting records in 2002, up from 30% in 2000, and their habits and interests are very different from others who got campaign news online. Nearly three-in-ten (29%) of these “deep diggers” said they looked for information on all election races (governor, Senate, House, local races, and ballot propositions), and 79% followed at least three kinds of these races. Almost half (46%) cited the Internet as one of their most important sources of campaign information, compared with 31% of all election news consumers. Voters who used the web to seek information about candidate voting records and positions on issues were especially likely to visit political websites. More than four-in-ten (44%) relied on these sites during the campaign, compared with 25% of those who engaged in one of those activities and 22% who did no research on issue positions or voting records. But these “deep diggers” were less likely than other election news consumers to rely on the news sites of commercial online services such as AOL (only 13% said they visited these sites). Those who sought out candidate issue and voting information said they used the Web because they do not get all the information they want from traditional sources: 48% cited this reason. Convenience was important to these heavy users, too, but no more so than for other consumers of online election information. Not surprisingly, active election information seekers reported very high levels of general interest in government and public affairs, apart from elections: 86% said they follow news on those subjects “most of the time,” compared with just half of the general public. In addition to getting campaign information, 68% also reported visiting websites about issues and policies of concern to them. Those who sought issue or voting information about candidates also made use of this information: twice as many who did this said the Internet helped them decide how to vote, compared with voters who were less active consumers of this kind of data (38% to 19%). More Republicans than Democrats go online for election news (by a margin of 18% to 11%), but there are few notable differences between political partisans in what they do online. Democrats and Republicans generally look for the same kinds of information, donate money and engage in online discussions at the same rates. But nearly half of Republicans who go online for election news (46%) said they like to register their opinions in online polls. By comparison, fewer than three-in-ten Democrats (28%) do this. With Republicans more likely to go online for election news and register their opinions in polls, the profile of those who take online surveys tilts heavily Republican. Half of those who said they like to take online polls were Republicans, while just one- in-five were Democrats. The Internet remains a secondary source of campaign news for most of the public. Only 7% of Americans said they got most of their news from online sources, slightly below the 11% who said this after the presidential election in 2000. Instead, most voters still look to television as a principal source of campaign news: two-thirds did so in the 2002 elections, down only slightly from 2000, when 70% cited television. But the mix of specific television sources was different from 2000 because of the local and regional nature of the midterm elections. Over one-third (35%) cited local television as a primary source, up from 21% in 2000. 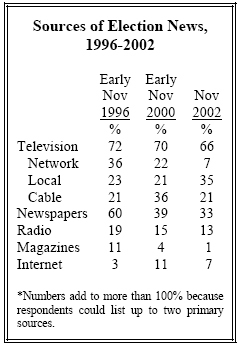 By contrast, only 7% mentioned network news, down from 22% in 2000. Cable was also a less common source at 21%, down from 36% in the presidential election year. Just a third of Americans said they got most of their news on the elections from newspapers. This was a six-point decline from 2000 (39%) and only about half the number who said they relied primarily on newspapers in 1996 (60%).